Natural processes shape the land, create soil and topsoil , influence the water supply, and help determine the plants and animals that live in each natural community . Some natural processes act on large scales and affect more than one natural community at a time. What is an ecological system? Erosion can occur on steep slopes, especially in areas where land use has degraded the immediate environment. This leaves shallow-rooted trees more vulnerable in wind storms. An ecological system is a group of several natural communities that share some features of physical setting and many of the same natural processes , plants and animals. 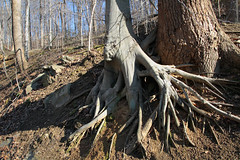 The Oak – Beech / Heath Forest is the only natural community in the Hardwood Forest Ecological System in Rock Creek Park. Any other natural communities in this ecological system are beyond the borders of the park. Click the chart below to learn more about this ecological system and its natural processes.